In the continual hunt for the best of its kind amongst the multitude of new apps launched each week the apps below are truly noteworthy and should form a proud new addition to any smartphone user’s selection of Go-To apps, to hopefully establish a long, lasting, highly enjoyable and productive relationship. PlayStation Video just arrived in the Play Store and this video app fills the gap that currently exists in the PlayStation console owner’s arsenal, albeit a little clunky at times. Users that call a PlayStation 3 or PS4 the nexus of their and media entertainment centre will be mighty pleased to know that Sony finally got into gear to release a PlayStation Video application compatible to a wide range of smart phones not just its own hardware. The PlayStation Video app provides its users with access to Sony’s digital media library containing a multitude of movies as well as television episodes that they can rent or even by from the PlayStation Store. This makes the user’s home console digital media library available directly from their pocket, making everything that they purchase on their smart phones instantly available via their PlayStation console. Strangely, for a company that produces and backs its own PlayStation with software, the app’s support for its own PlayStation Vue television streaming service seems broken in this current version. The strangeness intensifies since the PlayStation Vue streaming service went live throughout the US earlier this week; however, broken software can quickly be mended and it still remains an extremely handy app for all PlayStation devotees. Faily Brakes, is a brand-new video gaming app that will see most attempts at playing this high-speed game and in a swift and spectacular fashion. In reality any attempt at controlling a car with non-operating brakes will result in several life-or-death nightmarish situations before coming to a standstill. 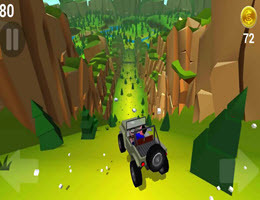 However, in this fun yet frantic game players must try to continually manoeuvre around cars, through trees and across rivers without any attempt at bringing their vehicle to any sort of safe stop, the aim is to continue blasting across the landscape while holding everything together for as long as possible before being ended by a catastrophic collision.